#catamaran – It's the time of year when any sensible sailor is dreaming of skimming across warm blue water without a care in the world, and feeling at one with the ocean. W M Nixon introduces an organisation which is built around this aspiration, yet has a deeper meaning for Pacific island communities. An island is both an escape, and a prison. On one side of the coin, it seems to provide the means of getting away from the tedium and pressures of over-crowded mainland life. On the other, you're trapped on it if you don't have some sort of choice and control over your own coming and going. For most of us around boats in Ireland, the ability to sail to islands is one of the greatest attractions in what we do. Sailing to our small islands is pure joy, truly satisfying in a way scarcely justified by the modest distances involved. And being on small islands is a delight. Yet generally we don't want to live on an island year in, year out. This may seem absurd to those who write off Ireland itself as no more than a small damp island somewhere out in the Atlantic. But for us living here in reasonable content, Ireland is just the right size. It's a complete place, a proper country – that it's an island is almost incidental. We don't really think of it as somewhere you can drive across in only three hours. It's the size it is, that's the way it is, and anywhere else is just unnaturally large. Probably we actually think of Ireland as a world unto itself – a small but viable landmass which happens to be surrounded by water. So if you want somewhere distinctly different, it's not the obvious one of great open continental land spaces of tundra or prairies or savannah, with unending mountain ranges or trackless tropical forest. On the contrary, the most complete contrast with Ireland is to be found in the Pacific, where the world is almost totally one of water, with tiny islands dotted about at vast distances, some of them with populations so small and remote that they're barely viable communities. In such circumstances, the people on the islands have traditionally needed to be truly at one with the ocean, embracing it with a natural affinity which meant they were able to voyage long distances in relative comfort with craft which may seem primitive to us. But those vessels too were in harmony with the sea – they didn't battle it, rather they went with its moods, leaving only the lightest of furrows in the ocean astern. 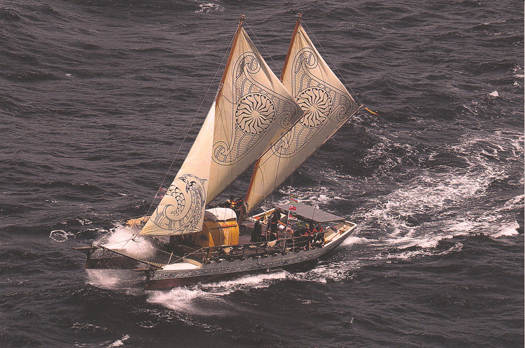 Despite being 73ft long and able to carry a crew of 16, the working weight of these vakas is only 14 tons, and they are easily driven with a relatively small sail area. The key to it all is the temperature of the sea. When you have an ocean which isn't going to give you hypothermia within an hour or two of immersion, you can voyage on light boats which skim the water. But in our northestern end of the North Atlantic, despite the tail end of the Gulf Stream washing our shores, here in Irish waters we need boats we can be in, rather than boats we're on. We need boats which provide a genuine level of protection from the sea and its punishing cold almost regardless of how we handle them. So, much as we like to feel we have an understanding with the sea, in some sort of empathy, in fact we're battling with it. Even the surfers who have been putting in such fantastic performances on the west coast in recent days are more akin to bullfighters than sea creatures. It's all about controlling something which is bigger than they, something which arises mightily but then dies and disappears, yet the surfer remains, banging away with his jetski to hit the right spot. For sure we respect the sea, but as this week's vids of the Safehaven boats being tested off Cork have shown, we aspire to boats which can continue to go about their business almost regardless of sea conditions, while providing complete protection for those on board. Although we may seem to have experienced some overwhelming weather these past few weeks, underlying our attitude is the notion that we know what's going on, that we're in control. It may seem a fine example of human folly and delusion. But the reality is that for most people in what we used to call the West, life is pretty much under control. We live by the clock. Trains, boats and planes leave and arrive pretty much on time. We build and control the machines, and the machines control the world. When disaster headlines erupt, it's only because this comfortable and mechanical state of affairs has been temporarily upset. But normal service is soon resumed. Set against this powerful certainty, small and isolated island communities in the vastness of the Pacific become fragile. While the elders may live naturally in the old ways and understand the workings of the sea and the necessary regularity and ordinariness of island life, their younger people know only that in the outside world, life is different. There's more readily available entertainment and excitement. There's a wonderful life of machines and timetables. Anyone who can pay the fare can go when and where they please. And huge numbers of people seem very happy with this state of affairs. So the island becomes a prison, not a paradise, as the old voyaging skills decay. The young people are no long capable of sailing away to distant places as their ancestors did, yet they lack the money to avail of the air travel which is often the only way to get off the island. And the soul of the community, if not actually lost, is sorely troubled. But there are those who feel that while the islands in the sun certainly have to adapt to the dominating realities of modern consumer-oriented life and global communication, they also reckon there's a way in which the old ocean voyaging traditions can be re-jigged to provide a meaningful experience for modern islanders, young and not-so-young. When that noted solo sailor Sam Davis of Strangford Lough was cruising the Pacific in recent years with his Rival 41 cutter Suvretta, he met up with a group in Tonga who so enthused him that when he finally arrived in our harbour on his way back to Strangford Lough last August, far from talking of his own remarkable voyages, he was almost completely absorbed by talking of the Tahitian Voyaging Society and their fleet of 73ft catamarans. That and mung beans. Sam is into mung beans in a big way. He seems to have lived on them for much of his voyage up the Atlamntic back to Strangford Lough. He was so keen to push the case for mung beans that I didn't have the heart to tell him that in our house we eat little else, apart from the occasional potato and some porridge. So he gave his sermon on the beans, and then we got back to the boats. And what boats they are. Everything about them is seductive – the way they sail, and the places they sail to. These are not brutal boats of the modern world which rely on ballast keels and high tech engineering and large auxiliary engines. Though their hulls are fibreglass, they are as simple as possible, relying on wind and solar power, and leaving no trace as they sail sweetly across the sea for thousands of miles. The Tahiti Voyaging Society is the inspiration of German sub-aqua film maker Dieter Paulmann, and in 2011 this remarkable initial fleet of seven 73ft catamarans began voyaging. Three years down the line, they've sailed tens of thousands of miles, and now other islands want to get in on this inspirational programme. This is where Sam and Suvretta get involved. After wandering to many strange places beyond the seas, they fetched up in Tonga and stayed for some time. Another voyager, Christy Butterfield, the woman boss of a Pacific charter ketch operation, introduced him to her crew – most of whom were Tongan - and then when the big catamarans (the Pacific name is a vaka) arrived in port, they brought him up to speed on what the boats were doing, and how they hoped that Tonga would one day have one if its own, just as places like the Cook Islands, Aotearoa, Tahiti, Fiji and Samoa already do. As it is, Tongan sailors have put in many sea miles as visiting crew on other islands' vakas and one of them - Aunofo Havea – was the first woman skipper in command for a long voyage, sailing the Hine Moana from Tonga to New Zealand. So the spirit is there, the ability is there, all they need is support. In an Ireland which is currently devoid of any sail training ships north or south, it may seem a bit far-fetched to be voicing enthusiasm for what is in effect a traditional sail training vessel for the Pacific islands. But if you happen to see Sam Davis bearing down on you with a determined look about him, be prepared to take on board an impressive load of information about Pacific voyaging and the vaka programme. And a bit of precautionary research on mung beans wouldn't go amiss either.